This is actually a tiny painting, only about 11" x 13", but it occupies a large visual space. 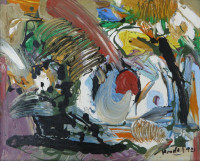 It is one of about 10 smaller works the DAF has acquired by Hanna during the 90's. I know and love Hanna's larger paintings: he makes large marks with such varied and intense energy and forms shapes and spaces that feel unfamiliar and completely unique to him. But I chose to highlight this small work because unlike Kendal's larger paintings, he would have used the movement of his hand rather than his shoulder to make the brush-marks, but the painting has the energy of an entire body moving around space.